Gearing production activities perfectly to one another is not sufficient for production in One Piece Flow! The supply of parts, tools and information must seamlessly connect to this. 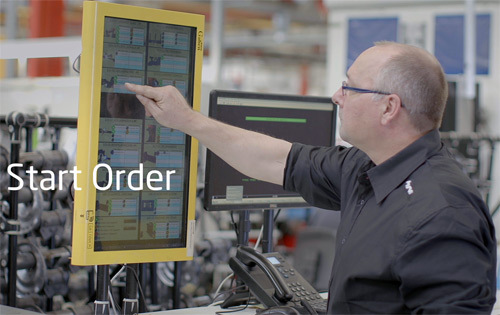 To this end, operators at KONI receive all the parts and tools just-in-time via roller conveyors, and at the same time, work instructions appear on their screens. This way, KONI is able to make 20% more shock absorbers with the same resources. 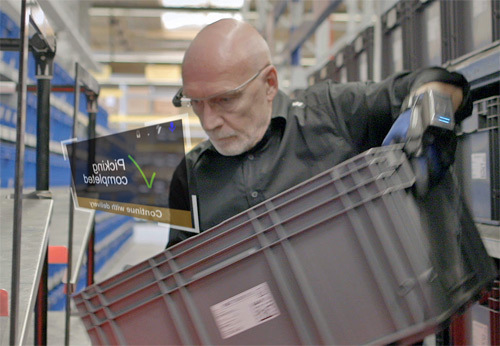 A story about operators playing tag along the production line, shoppers with augmented reality glasses who provide them in time with goods, and custom made software that connects people, materials and information. The 160-year-old KONI is part of the American multinational ITT since 1972. KONI was founded by Arie de Koning, who started the production in his father's saddlery. De Koning decided to develop a new generation of shock absorbers, after examining what was wrong with the existing ones on the market. The rest is history. 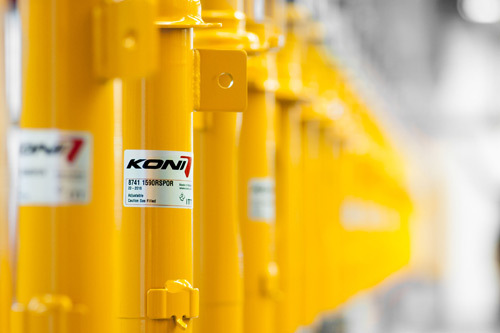 Today, KONI has been specialized in the production of hydraulic shock absorbers for 85 years. Their head office and R&D-department are located in Oud-Beijerland, in the Netherlands. Here, also shock absorbers are produced for cars, buses, trailers and defense vehicles. In the same factory they also make specials, such as shock absorbers for bridges. 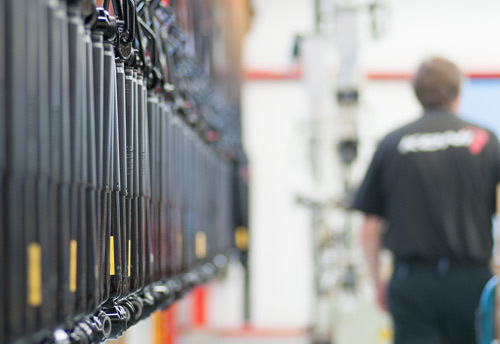 Being an automotive supplier, KONI has to be able to deliver just-in-time to their customers. This means frequent delivery in small quantities, in line with the Lean production in almost all automotive factories. To make this possible, it is best if the production within KONI’s own factory is also Lean. In Lean, production chains that create one end product per fixed time interval (the takt time of the line), are the holy grail. This is called production in a One Piece Flow (OPF). Each takt time, at every work station, one product is processed and then moved to the next station. This makes it possible to make just the amount of shock absorbers the customers asked for, after which these are immediately delivered to them. As a result, KONI does not need to keep stock that reduces their amount of working capital. In addition, production errors are detected early, and do not lead to large batches of defective products. The reason: a problem is often quickly detected at one of the next production steps. This means that you only have to reject or adjust a few products. However, production in OPF was not easy to achieve at KONI. The reason: they make no less than 4000 variants of shock absorbers, based on 12000 parts! Perhaps the explanation for this are emotional disadvantages related to single-piece production. Then, after completing a single task on a single product, you have to switch to what could be a new task on another product. Besides that, you become dependent on the production step preceding you. When this step does not deliver the next intermediary product to you in time, you have to wait. Balancing: all steps in the production chain must function reliably, and must be - and stay - attuned to each other. 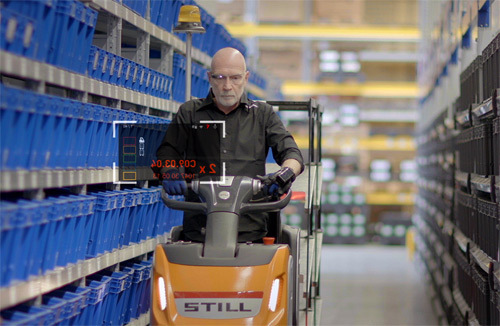 Just-in-time supply, perpendicular to the OPF line: Operators must get all the required materials and information at the right time at their workstations, to make it possible that they can continue to work. Materials can be parts, tools and/or molds. Information mainly consists of work instructions for tasks to be performed at a particular moment. Connection: A software system is needed to support the two points mentioned above, by connecting people and machines. Think of software that (a) ‘tells’ the pickers in a warehouse, which materials they have to bring to which workstations along the OPF line, and (b) ‘tells’ the workstations which type of semi-finished products will arrive there at which moment, so that appropriate work instructions can be displayed. As we will see later, KONI was able to meet all these three conditions! The transition to OPF production turned out to be a major operation. KONI called this project material flow. Hydraulic shock absorbers serve to damp both springing in and out. These type of shock absorbers consist of two tubes inside each other, filled with oil. The inner one has a piston rod with a piston at the end, and a foot valve at the bottom. During ‘springing in’, for example needed when you drive with a car over a bump, the piston rod moves downwards. To make this possible, oil flows upwards via valves through the piston and through the foot valve. The resistance during this process causes the damping. ‘Springing out’ is the reverse process. The outer tube acts as an oil reservoir, to compensate for the varying amount of volume occupied by the piston rod. During a downward movement (springing in), this volume for example increases. In a traditional OPF production line, operators stay at their workplace, where every ‘takt time’ a product to be processed passes. This makes the flexibility very limited. After all, if your predecessor along the line needs a little bit longer than one ‘takt’ to complete his or her work, you have to wait. To prevent this, you could perfectly balance the line, ensuring that every task takes exactly the same amount of time. However, this becomes impossible if you make many different products with one production line, as KONI does. In addition, having to comply to an exact ‘takt time’ to complete tasks can be stressful. Therefore, KONI implemented a more flexible OPF variant, the bumping system. Taiichi Ohno from Toyota originally called it the batton zone system. Bumping has the advantage that the production line constantly rebalances itself. As a result, variable processing times are no longer problematic. In addition, the operators no longer experience the pressure of an exact cycle time, while on average still every ‘takt time’ one finished product leaves the production line. The words bumping and baton, the latter referring to ‘tagging out’, describe this moment. When you are ‘tagged out’, in your turn you take over the work of the person behind you. And so on. In case you are ‘tagged out’ at the beginning of the production line, you start to assemble a new product. Bumping ensures that the flow continues, despite variable processing times. You might say that the bumping moments serve as shock absorbers! Theoretically, this makes it even possible to produce faster than in an OPF with fixed processing times. After all, operators never have to wait until a previous task is finished. With the bumping system, KONI had met the first condition for OPF production. They had realized a chain of well-coordinated production steps. However, the other two conditions for OPF production, just-in-time supply and connecting people and machines, turned out to be much more difficult to achieve. Not for nothing the absence of those two prerequisites was the reason that previous OPF attempts had only limited (read: local) success! As early as 2012, KONI invested in a fully automatic warehouse, equipped with a miniload system for the supply and the removal of small containers. This automatic warehouse also includes a maxiload system for the handling of pallets, and a shuttle system. ‘The power of these systems, which automatically collect the materials you need, is at the same time the weakness’, says Bleeker. In the past, all materials for three full production days were brought to the factory floor in advance. This was done on the basis of a Material Requirements Planning (MRP). So, materials were ‘pushed’ to the factory floor, instead of ‘pulled’ by the work stations when needed. The solution: a so-called supermarket. This is a small buffer between the warehouse and the shop floor. 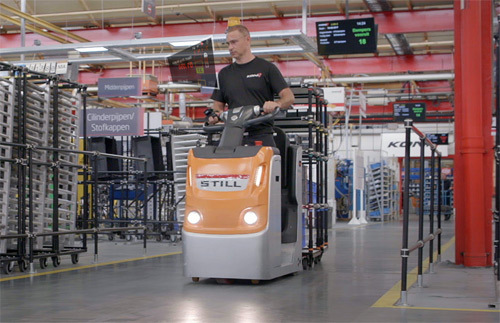 Logistics assistants or shoppers, KONI calls them water spiders, ‘shop’ in this supermarket and deliver the right materials to the operators in time. This means delivery on the basis of pull, thus only when needed. The supply of parts for specific types of shock absorbers, is done in a similar way. Two days in advance, those parts are transferred from the central warehouse to the supermarket, and put ready there in bins, in the appropriate quantity for one production order of one type of shock absorber. After use, these bins return empty. The ‘presentation’ of the bins to the operators is done by placing them on a roller conveyor. This is done just-in-time, in line with the OPF production sequence. After use, the operator places each bin back on the roller conveyor. With their augmented reality glasses the shoppers see what they have to bring to the operators from the ‘supermarket’. Those glasses are a new version of Google Glass, with improved battery, camera and wifi. However, these are no longer sold under the Google brand name. After pilots at, among others, KONI, Glass Enterprise Edition was officially launched in July 2017. The last condition to be fulfilled to make OPF possible: digitally connecting everything and everyone! The shoppers for example need to know which materials they have to bring to which workstations, and the workstations need to ‘know’ in which order different types of shock absorbers will arrive. Only then can the workstations present appropriate work instructions to the operators, and timely send ‘pull’ supply orders to the shoppers. It must always be clear what the current situation in the factory is, the software must have an ‘image’ of it. Finally, the operators and shoppers must be able to report which activities they have completed. In the supermarket now lays an amount of stock for one production day, instead of the amount of stock for three production days that used to be present on the workfloor.